Braga is the third major city in Portugal located in northwest Portugal. Originally founded by a Celtic tribe and later occupied by the Romans, it became the country’s religious capital in the 11th century and the home of Portugal’s Bishops. Today it is a vibrant, modern city with an attractive old quarter and where most of the historical sites are within easy walking distance from the main square, the Praca de Republic. The Torre de Menagem, which stands in the square, is the only remaining evidence of the original fortifications of the city in the 14th century. The Cathedral replaced a much older church which was destroyed in the 6th century and is now the oldest in the country. 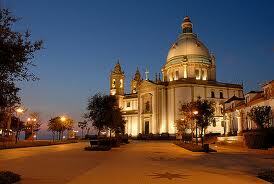 It has a stunning interior with a baroque double organ decorated with golden cherubs and sea creatures. The King’s chapel contains the tomb of Portugal’s first king, Afonso Henriques, and the stairs by this cloister lead up to a collection of treasures. The neighbouring square is filled with equally beautiful building such as the Town Hall with its stunning facade and baroque fountain of a pelican and bronze cupids. Close to the Baroque church, Santa Cruz, is the Palacio do Raio which has a very impressive ornate, blue tiled facade. There is also the Archbishop’s palace, the 14th century Antigo Paco Episcopal, which is now the Municipal Library. If you are interested in visiting some museums there is a display of Portuguese period furniture in the Palacio dos Biscainhos and for something more unusual the Museu de Imagem has an exhibit of 120,000 old glass photo negatives. 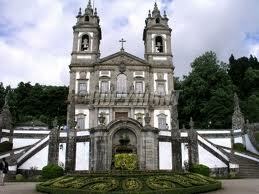 One of Portugal’s most famous tourist attractions is the Bom Jesus de Monte. This sanctuary was built on a hillside overlooking the town in 1722 and its unique staircase leading up to the church is an amazing sight. Dedicated to the five senses there is a fountain that represents each one; sight, touch, smell, sound and taste. Behind the church are three chapels which represent the different stages of Christ’s journey. If by chance you are not up for the climb there is a primitive funicular railway built in 1882 that is still operational and will take you to the top. For those who enjoy nature and hiking, to the northeast of the city is the southern end of the Peneda-Geres Nature Reserve. It is also where you will find the second most famous pilgrim site in Portugal with over 2.5 million visitors a year making their way to this sanctuary. Not far from the Nature Reserve is the small Spa town of Caldas de Gerez. With several health and relaxation treatments available it would make a wonderful treat after a long hike. To the east of Braga is the town of Povoa de Lanhoso where the ruins of an ancient castle dating back 2,000 years stands majestically on top of a massive rocky formation. The ruin however has a rather dark history. One particular drama which took place was when one of its owners found out his wife had been unfaithful and set the castle on fire killing not only his wife but everyone else residing in the castle including all the livestock! If you feel like spending some time on the beach, there is the popular beach town of Esposende. On route is the town of Barcelos which is well known for its pottery. Barcelos was also the home of the artist Rosa Rahalho who lived in the 1800’s and whose ceramic pegan figures are seen in museums and much sought after by private collectors. South of the city is the town of Guimaraes, a World Heritage Site which was the first official capital of Portugal. Only fifteen miles north of Guimaraes is an Iron Age settlement with approximately 150 original stone dwellings that were discovered in the 19th century. Both would make a very interesting day out. If you are looking for a good hotel in Braga, consider the Golden Tulip Braga Hotel which overlooks the city. A reconstruction of a 19th century convent, this impressive luxury hotel is regularly used by top international football teams for their matches in Portugal, as its facilities include a fottball pitch, tennis court, health club, indoor pool, gym and sauna. What more could any sports enthusiat ask for!